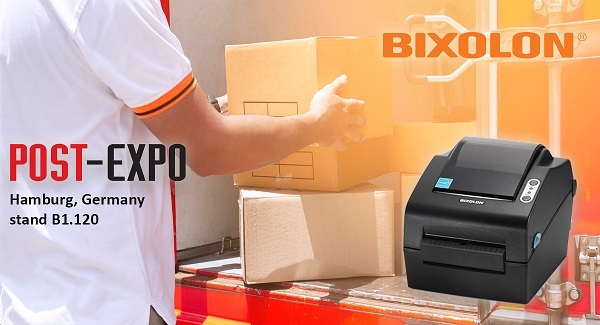 POST-EXPO (8 -11 October 2018, Hamburg, Germany) – BIXOLON (stand B1.120), a leading global manufacturer of advanced Mobile Label and POS printers, will be showcasing products from its portfolio of Auto-ID logistics printing solutions throughout the show. Designs that offer cutting edging labelling technology for the transport and logistics market, BIXOLON will be demonstrating the two NEW 4-inch direct thermal printing solutions, the SLP-DX420C designed for new patented labelling media and the SLP-DX320CT for linerless labelling solutions. Alongside will be the new XT5-40 industrial 4-inch thermal transfer printer, BIXOLON\-\-s first heavy-duty printer aimed at the high volume, industrial printing market. BIXOLON will also be celebrating its fifth consecutive year as the Global No.1 Mobile Receipt Printer Manufacturer as quoted by independent Japanese Research Company Chunichisha. Exhibiting its comprehensive range of 2\”, 3\” and 4\” mobile printing solutions compatible with industry leading mobile and PDA technology. Including the 2-inch SPP-R200III highly mobile printer with Bluetooth, Wi-Fi, USB and Serial connectivity. The updated 3-inch mobile printer the SPP-R310plus, features enhanced add-ons including Bluetooth 4.1 and dual-band Wi-Fi. Plus the 4-inch SPP-R410 rugged mobile printer with NFC auto-pairing.